My last two blogs looked at the First World War experiences of George Cuthbertson, a marine engineer from South Shields and Annie Hamilton, a nurse. This blog looks at the Second World War and in particular the story of a much loved and admired warship HMS Kelly. It remembers the skill of the men who built and repaired the ‘Kelly’ and the great courage of those who served on her and gave their lives in the defence of their country. “We felt that every ship was a vital contribution to victory; that every rivet hammered home was another nail in Hitler’s coffin. More important still, we knew that if we did not produce the ships the alternative was unthinkable disaster” (Our Ships at War by R. & W. Hawthorn Leslie & Co. Ltd). The keel for HMS Kelly was laid on 26 August 1937 and she took two years to complete. 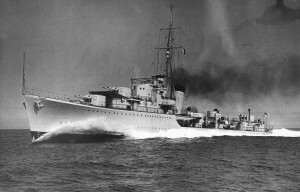 She was a K-Class destroyer, named after the Admiral of the Fleet, Sir John Kelly whose daughter launched her on 25 October 1938. Her Captain was Lord Louis Mountbatten. After War was declared on 3 September 1939 HMS Kelly was straight into the thick of the conflict. The following day together with HMS Acheron she helped to sink a u-boat and on 12 September HMS Kelly brought the Duke of Windsor (the former King Edward VIII) back to England from Le Havre. During her short career the ‘Kelly’ suffered a lot of bad luck. In December 1939 her stern was damaged after she struck a German mine just off the River Tyne. Repairs were not completed until the following February. Much worse was to come. On 9 May 1940, while searching for German minelayers in the North Sea, she was torpedoed with the loss of 27 lives. Many of these men are buried in Hebburn Cemetery. “…when this perilous journey began, my Navigator asked me where we should make for – and without a second’s hesitation I replied: Hebburn. I knew the ship’s birthplace was where she should return; and not only was the Kelly given a new lease of life, but my decision was more than justified by the real human sympathy and interest alone which was shown to our wounded and killed” (Our Ships at War by R. & W. Hawthorn Leslie & Co. Ltd). “Kelly was got into harbour not only by the good seamanship of the officers and men, but also on account of the excellent workmanship which ensured the watertightness of the other compartments. A single defective rivet might have finished her” (Our Ships at War by R. & W. Hawthorn Leslie & Co. Ltd). HMS Kelly was assessed and the necessary repairs carried out by the workers at Hawthorn Leslie. The Archives holds a photograph album kept by the firm, which shows the full extent of the damage. These images are included in a new flickr set. The repairs were completed and the ‘Kelly’ returned to service in December 1940. By May 1941 she was leading the 5th Destroyer Flotilla in the Mediterranean. 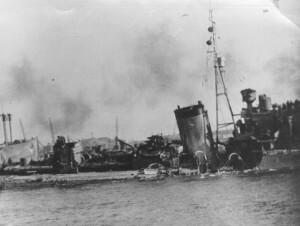 Tragically, on 23 May while returning to Alexandria she was bombed and sunk by the Luftwaffe. Survivors were picked up by HMS Kipling but the loss of life was terrible. 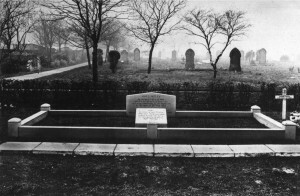 One hundred and thirty men were killed and they are remembered in memorials at Hebburn Cemetery, together with the 27 crew members who perished in May 1940. “None of us will forget how members of the Yard contributed to the Memorial which was put up in the Hebburn Cemetery, or the kindness and sympathy of those who tended the grave. There is a strong mutual bond between the men who build our ships and the men who sail in them and fight in them; and this has perhaps never been more clearly shown than it was between us in the Kelly and you in the Yard” (Our Ships at War by R. & W. Hawthorn Leslie & Co. Ltd). Thank you for posting this very interesting article. My father had two photos of a ship at sea in his papers and I just recently found out that it was of HMS Kelly. I don’t know why he had them, as far as I know he was just into his apprenticeship in 1940 at one of the yards, I always thought that it was on the Wallsend side of the river but may not have been. Thank you very much for getting in touch and for your kind words. In due course I’m hoping to add a few more images of the Kelly to our flickr set so do keep watching. I completely agree. It’s very telling that when she was torpedoed in May 1940 the Captain, Lord Mountbatten, headed straight to Hebburn. Thanks for getting in touch. Always interesting to read about HMS Kelly. My grandfather John Taylor B.E.M was Forman Loftsman (Shipyard), and was one of the first to survey the mine damage to the ship when she was in dry dock in 1940. At one time there were three generations of Taylors working at Hawthorne Leslie. There is a photo of the elder John Taylor aged 90yrs being presented to their majesties King George VI and Queen Elizabeth in 1943. When asked why he did not remove his cap he said “I wasn’t going to risk catching my death of cold”. I also have a copy of the Articles of Apprenticeship of the other Taylor, John Maurice dated 2nd July 1943. To add to the family connection with Kelly, my late mother Thelma Taylor worked as a tracer in the drawing office at Hebburn. 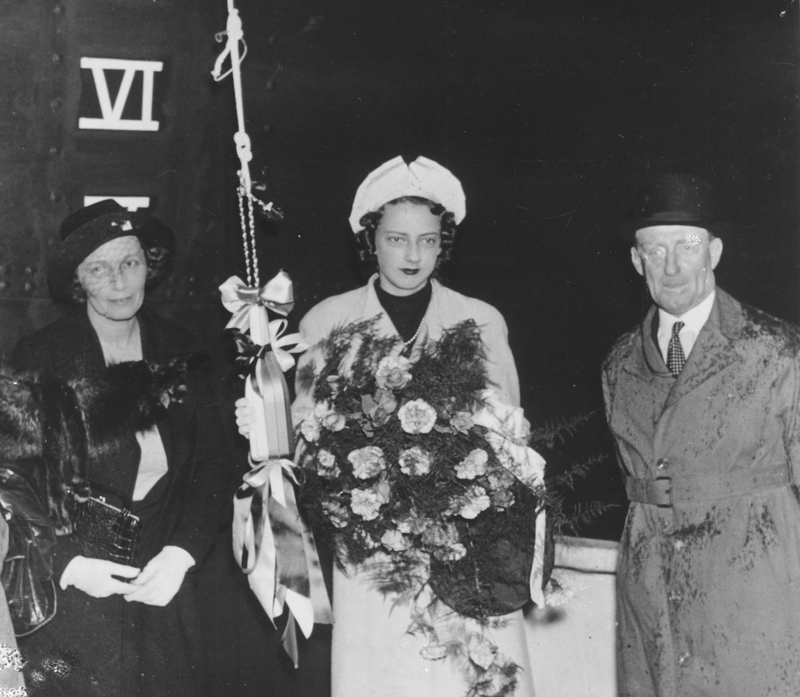 Thanks for getting in touch – great story about your ancestor being presented to King George VI and Queen Elizabeth. If I come across any photographs of that royal visit I’ll try to add them to our flickr set. If you ever want to visit us and take a look at the extensive Hawthorn Leslie records we hold then please do. You can find our opening times on our website http://www.twmuseums.org.uk/tyne-and-wear-archives/visiting-us.html. When you contacted us last year you mentioned your ancestor, the elder John Taylor. As you know, he was presented to King George VI and Queen Elizabeth in 1943 during their visit to the Hawthorn Leslie shipyard. An image of that event is included in one of our recent flickr sets and incase you’re interested I’m including a link to it http://www.flickr.com/photos/twm_news/10817995495/in/set-72157637591347495. Nice one Alan – the more shipbuilding blogs the better. One small problem however. When ‘Our Ships at War’ was published the true story of u boat losses was not available and people believed the wartime propaganda. The first u boat sunk in WWII was U39 which was sunk off the north west coast of Ireland on 14th September 1939 by HMS Faulknor, HMS Foxhound and HMS Firedrake. The phantom u boat sunk by HMS Kelly did not exist but made for good propaganda. A parallel would be the number of times that the Germans claimed to have sunk HMS Ark Royal. Sorry for nitpicking – keep up the good work. Lovely to hear from you. You could well be right. There seems to be a consensus that HMS Kelly and HMS Acheron saw off a u-boat attack on 4 September but maybe claims of their success were exaggerated for propaganda purposes. Glad to see you’re reading the blogs. As an ex Navy man of 25 years, it was really good to come across this blog I have always been interested in the “Kelly”, having been part of boys under training in 1958 at HMS Ganges when Lord Louis came to address us and to tell us we were about to embark on a career in the finest Navy in the world. That was very true and I subsequently enjoyed the next 25 years to prove it. 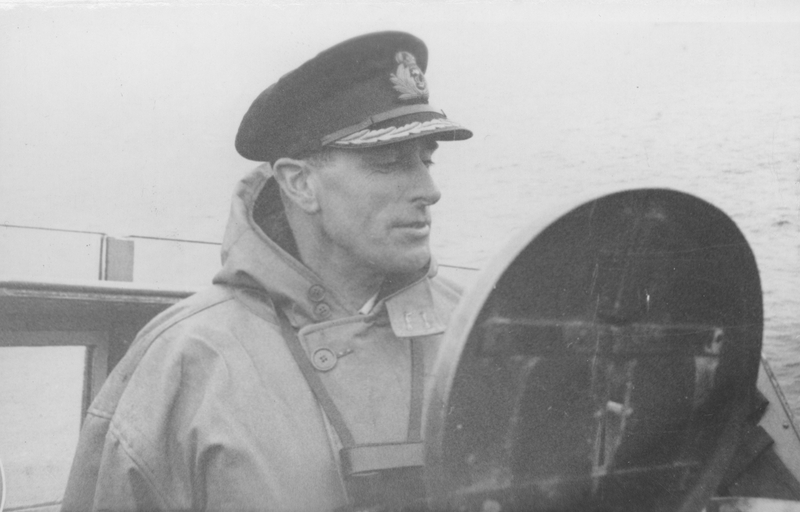 Mountbatten was a very impressive man and reading the various Kelly stories I can understand how he would be so admired and respected by his ships company. I feel however, the great man would be turning in his grave if he could see what today’s politicians are doing to the Navy. It’s a national disgrace and surely one that will come back to haunt them, and the nation one day. Sorry to get political but I can’t let pass that the memories of yesterday’s fine ships and their ships companies is being trashed by politicians not fit to lace their steaming boots!! Thank you very much for your kind words. No need to apologise for speaking your mind. It’s great to have your comments – I can tell that they’re really heartfelt. alway’s been interested in the kelly as my mothers 1st husband joe scott from liverpool was killed at the battle of crete leaving my one year old stepbrother. she met my father and married again ( he was torpedoed twice in the atlantic ) and i was born 2 week’s after the war ended. Thanks for getting in touch – I really appreciate you taking the trouble. HMS Kelly certainly seems to have touched a lot of lives. Hi, was very interested to read the above about you mum’s first husband Joe Scott who lost his life when HMS Kelly was torpedoed. My dads brother who was 21 also went down with HMS Kelly and my nan never recovered from his death. Found a photo with the whole crew, but no idea where he is on the photo. Was Able Seaman. Went down with the ship off Crete while manning the Pom Pom guns. He was 16, his name was Harry, I have a photograph of him in his uniform, but no other information about him. My Nan treated him as her own, never got over his death. May they all rest in Peace. Thanks for sending your message, which was very touching. Your trouble to include the poem is really appreciated. Incredible that the ship managed to get back to Hebburn in such a terrible state. Thanks for your comment. You’re quite right – looking at the image of the Kelly returning to Hebburn under tow it’s amazing that she was saved. A real tribute to the courage and ability of all those involved. My father, Kenneth Jeffery, who served on both commissions on HMS Kelly has just been recounting his memories of the war to my grandsons who were fascinated to hear of him being torpedoed and then bombed. They also felt the hole in his head caused by his injuries when the ship went down. He was a gunner and will be 93 in May. I was wondering if you were able to please email me a copy of the photo of the ships crew? My great uncle Jack Johnson died during the torpedoing in 1940 aged 21 also. He was a 2nd Class Stoker. I’m desperate to find out further information or images of him. Hi Helen, the stoker you mention is my fathers brother Jack,I have a photo of him in uniform but not with the crew, I would be interested in any info you have.please contact if interested. My Uncle also served on HMS Kelly and lost his life at the battle of Crete in 1940. He was an ‘Engine room Artificer’. Dad often spoke of him. I also have the crew photo but do not know how to post it here …? Thanks for getting in touch. It’s great that your father is able to share those memories. One of the many great things about Archives is that they help to keep memories alive. I hope that the flickr set helped your father remember some good times and not just the tragic ones. I’m sure that events on HMS Kelly must have had a profound impact on his and many other lives. Please pass on my regards to your father. He and the men that served with him are owed a great debt of gratitute for the sacrifices they made. remember my great uncle Arthur telling me stories about his brothers who served and died on the Kelly.When I was old enough he showed me pics of the entire ships company and a hand written letter written to his mother from Mountbatten.Just been helping my son with his school project,and these pics have brought back some wonderful memories of a great man. Thanks for getting in touch. I’m really pleased that the images on flickr have brought back some happy memories. I hope that your son’s school project goes well. Could anyone tell me more about the HMT Evelina which hit a mine just off of Souter lighthouse on the 14th December 1939. As an amateur geneologiest my husbands great uncle was one of the eight crew killed on the sinking. I’m afraid that we don’t appear to have any records of HMT ‘Evelina’ or her loss. She was launched in 1919 as the ‘John Howard’ by the shipyard of Rennie Forrestt at Wivenhoe (near Colchester) and renamed ‘Evelina’ in 1921. She was requisitioned by the Admiralty during the Second World War. It might be worth seeing if anything was mentioned about the sinking of the vessel in the local newspapers so you could try contacting South Tyneside Local Studies Library http://www.southtyneside.info/article/8862/Local-history-zone. It might also be worth contacting the National Archives http://www.nationalarchives.gov.uk/records/ and the National Maritime Museum http://www.rmg.co.uk/national-maritime-museum/ to see whether they have any records. There’s also information available online on various websites, although I suspect you’ve already explored those. Hi Alan In 1958 I was a lady tracer at Hawthorn Leslies St Peters and I can always remember my boss Miss Dickinson who as a young tracer in the drawing office watched the Kelly being towed up the Tyne. She told me that everyone worked day and night to repair her and get her back on duty. I will always remember the emotion and pride she had when describing the efforts of all the workers.HMS Kelly always had a special place in the heart of those workers. Thanks very much for taking the time to get in touch. Your thoughtful comment really confirms the impression I got from other sources – that people in Hebburn (and at Hawthorn Leslie in particular) had a really strong emotional bond to the ship. It’s really inspiring to learn about the dedication and pride that the workers took in building and repairing the Kelly. Many thanks for your message. Great to read all these comments and testimonies and thought I would add a little to it. My grandfather James Low Collins was a shipwright at Hawthorn Leslie from about 1927 to the mid-1960s and was part of the team who built HMS Kelly – and repaired her several times. When you read the history of Kelly you can see she was an ‘unlucky’ ship with numerous incidents. Dec 1939 struck a mine while rescuing Atheltemplar. Work completed 28th Feb 1940. 2nd Mar 1940 struck HMS Ghurka. 8 weeks in dry dock (on the Thames) and released 27th April. 9th May 1940 torpedoed during Battle of Norway and towed back to Hebburn and repaired in December 1940. Thanks for your input. As you say she certainly was unlucky throughout her career. Although the story of HMS Kelly is ultimately very sad, it’s very heart warming to hear of the admiration that she inspired and the dedication of the men who built and served on her. My grandfather was one of the men who helped the undertakers to remove the bodies off the Kelly as it had to be done in a rush there was not enough people so he helped. As the last man was taken off my grandfather took it upon himself to take a momento and this was one of the black “shadow” aeroplanes from the ship ooooppppssss 🙂 my dad still has this today and hopefully he will pass it onto me ! He gave me a book a few weeks ago to read called Kelly by Kenneth Poolman. My dad is very proud that he served his time at hebburn and was a merchant sailor himself. I will pass on comments I have read. Thank you very much for sharing details of your grandfather’s link to the Kelly. It’s a real privilege to learn of how she touched so many lives. My father served on hms Kipling and was involved in the rescue of crew members of the hms Kelly when it was attacked. his name was James WIlliam Jewell, he was a telegraphist on the Kipling. He met my mother Agnes May Hall, while docked in Hebburn, she was from Hebburn. Their romance blossomed and they married. His love of being in the Royal Navy was evident all of his life and every armistice day we would visit Hebburn cemetary to honour the men killed on the Kelly, although I was a small child I remember it well and how sad it made my dad. I have lots of photos of my dad on board ship and a photo of prisoners in Tobruk. I was born in Southsea Portsmouth and moved back to Hebburn with my parents where I lived for twenty one years. My dad worked in Reyrolles until he sadly passed away in 1971, he now is buried in Hebburn cemetary. I write to you because I have lots of memories of my dad telling me about his time on hms Kipling and the rescue of Lord Mountbatten. My dad along with all of the men on both the Kelly and the Kipling, where very brave men indeed. Kind regards. Marilyn Hall. Thank you very much for taking the trouble to share details of your father’s experiences and memories. I found it really interesting. As you say, he and the men who served on the Kelly and the Kipling were very brave – they must have witnessed and endured some terrible times. It’s great that your father continued to honour the men killed on the Kelly by attending the Remembrance Sunday commemorations at Hebburn Cemetery. It remains an important annual event. The responses I’ve had to my blog have really shown me how important the memories of the Kelly are not just to people in Hebburn but throughout the world. She touched so many lives. My name is Marianna. I am working as a historical researcher in the Republic of Ireland. In my work I focus on the aristocratic family from Co. Waterford, named Beresford. There was one of the Beresfords, Lord Hugh Tristram de la Poer Beresford, who served on HMS Kelly as a Commander-Lieutenant. He died with the ship, 23rd May 1943 during the Battle of Crete. He is buried at the El Alamein Military Cemetery. I am looking forward to your emails! I am so happy to have found this article. Thank you for publishing. Many thanks for your comment. I’m afraid that we haven’t got any relevant material here but the National Archives has a useful guide to records http://www.nationalarchives.gov.uk/records/looking-for-person/commissionedofficerroyalnavy.htm. I hope you get plenty of responses. I have only commenced my research, but already find very fascinating. I do too hope there are people out there who will be willing to talk to me about Lord Hugh. Thank you again for this wonderful article and responding to my post. Hi my grandfather served on the. H.M.S Kelly I’m 48 years old he died when I was 6 my mum has his photo albums of his time on the Kelly . As you may gathered, I am conducting a research on Lt. Cmdr. Lord Hugh Tristram de la Poer Beresford RN (1908-41), who was a Lt. Cmdr on Kelly, during her last voyage. You mentioned that your grandfather served there too and that you had his photo albums. It would be lovely to be able to see them. Do you think we could meet some time in the future? I am based in Ireland, but travel to England on the research purpose every now and so often. Please, do kindly let me know if you would be willing to share your knowledge and show me your grandfather’s photo albums, at your convenience. Thanks for getting in touch. Your grandfather’s photograph albums sound fascinating. I suspect that your mother would want to keep the albums in the family (they must have great sentimental value). However, if she ever wanted to donate them to a record office then we’d be delighted to hear from her. Hi all, a small story that may be of interest, yesterday morning April 29th, while walking on the beach at low tide in whitby, I found a life belt with the words HMS KELLY written on it, I had never come across the name before so I tried searching the ships name via google on my mobile phone, but I was unable to recieve a signal due to the location” ( bottom of the cliffs) so i took a photo of it for the purpose of researching it later and decided to leave it were it had been washed up, last night I put the name in google search, and I came across some very interesting and informative information about the history of hms Kelly during her short carrier , wow! The thought occurred to me that this lifebelt must have drifted for many thousands of miles , and for what must be 73 or 74 yrs since it’s sinking (May 1940/41 ?) I can’t be precise as dates differ, however the fact it has travelled all this way and over all these years almost to its own birth port (Hebburn) just up the coast from whitby is amazing” and it’s timing could not have been more appropriate since next month will be the anniversary of its sinking, anyway after finding out just what an interesting article I had found and left on the beach, I decided that I would go back down when the tide was out this morning and hopefully if it were still there and had not been reclaimed by the sea I would retrieve it” to conclude, I went down as the the tide was still receeding this morning and I found it just where I left it! To all of you whom have a family connection or interest in the HMS KELLY i hope you have enjoyed reading my email” my kind regards to you all, peter. Thanks for your comment – it’s really appreciated. I’ve spoken to a colleague who has more expertise in these matters and he’s fairly sceptical that your lifebelt would be an original item from HMS Kelly. He feels it’s unlikely that it would survive for so long in the water and also suggests that a WW2 Royal Navy lifebelt wouldn’t have included the vessel’s name. He wonders whether it might be a commemorative lifebelt thrown into the sea at a later date. I hope this response isn’t too disappointing! Hi all, a small story that may be of interest, yesterday morning April 29th, while walking on the beach at low tide in whitby, I found a life belt with the words HMS KELLY written on it, I had never come across the name before so I tried searching the ships name via google on my mobile phone, but I was unable to recieve a signal due to the location” ( bottom of the cliffs) so i took a photo of it for the purpose of researching it later and decided to leave it were it had been washed up, last night I put the name in google search, and I came across some very interesting and informative information about the history of hms Kelly during her short career , wow! The thought occurred to me that this lifebelt must have drifted for many thousands of miles , and for what must be 73 or 74 yrs since it’s sinking (May 1940/41 ?) I can’t be precise as dates differ, however the fact it has travelled all this way and over all these years almost to its own birth port (Hebburn) just up the coast from whitby is amazing” and it’s timing could not have been more appropriate since next month will be the anniversary of its sinking, anyway after finding out just what an interesting article I had found and left on the beach, I decided that I would go back down when the tide was out this morning and hopefully if it were still there and had not been reclaimed by the sea I would retrieve it” to conclude, I went down as the the tide was still receeding this morning and I found it just where I left it! To all of you whom have a family connection or interest in the HMS KELLY i hope you have enjoyed reading my email” my kind regards to you all, peter. I am trying to find out more information about my uncle John O’ Neil he served on HMS Kelly as radio operator in 1940 . Can anyone help ? Many thanks for getting in touch. I’m afraid that the Archives only holds records relating to the construction and repair of the Kelly so sadly we can’t help. However, another reader might have some useful information. I’m sure they’ll get in touch if they do. If you haven’t already tried contacting the Ministry of Defence then there’s some useful information on how to do so on the Veterans UK website http://www.veterans-uk.info/service_records/service_records.html. I really hope you find what you’re looking for. Can anyone give me any information about my uncle George Ransom who was a Chief Petty Officer coxswain on HMS Kelly and was killed when she was sunk off Crete. I would like to know if he was on the bridge at the time. Thank you very much for your comment. I’m afraid that we don’t have anything here at Tyne & Wear Archives but maybe a reader of the blog will have some information. The National Archives hold a lot of records relating to the Royal Navy and their website has some useful research guides http://www.nationalarchives.gov.uk/records/atoz/r.htm#. Sadly those records are unlikely to answer your main question about your uncle. Many thanks for getting in touch. I believe that the original ship’s bell of HMS Kelly is in South Shields Museum. It was acquired in 2010 and there’s an article about it here http://www.thejournal.co.uk/news/north-east-news/tyne-wear-archives–museums-4463140. My first thought is that yours might be a commemorative bell but I’ll forward your message to a couple of colleagues who may be able to give you a more authoritative answer. Thank you, Alan. I found your article very interesting and informative but also I must admit, a bit confusing. I’ve read various accounts of the short career of HMS Kelly and find inconsistencies abound. I wonder if you would be kind enough to check the facts laid out in the following which I wrote some years ago. My father didn’t build the Kelly all by himself. He had help but such was his pride in the work that I had the impression as a youngster that my father did indeed build the Kelly. He was a plater. that it would never sink, never sink. the ship, they said, would battle through. And it did. And it did. And her doom. And her doom. and her decks were all awash. and kept the craft afloat. many of her crew lay dead. to the men that he had lost. Thanks for sharing those verses. They’re very moving. The images that I came across of HMS Kelly in the Hawthorn Leslie collection relate to torpedo damage caused in May 1940. I mentioned the mine damage in December 1939 in the blog but the photographs don’t relate to that incident. The limited information I have doesn’t suggest that any lives were lost as a result of the mine damage in December 1939. 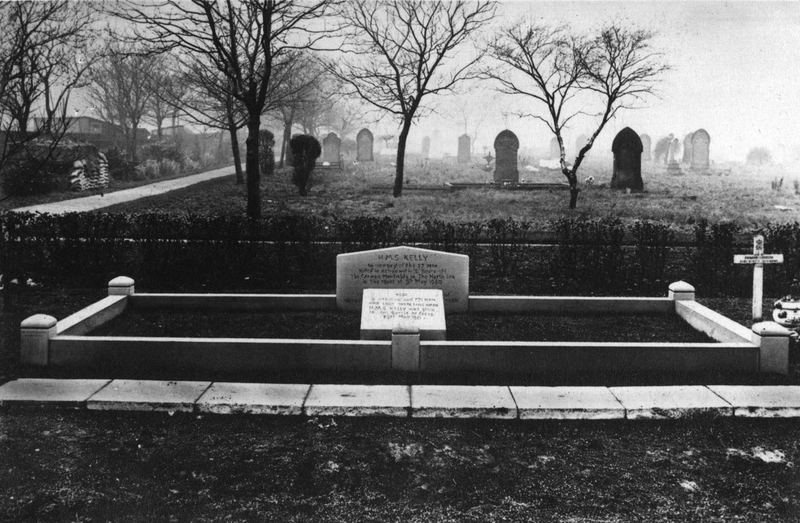 Sadly 27 crew members lost their lives in May 1940 and were buried at Hebburn. I wonder whether the two incidents have been merged slightly in your verses, which perhaps explains some of the confusion. I hope this helps. Hi Alan! Can you please email me as we might be able to help each other out regarding the ship yards!? Thanks for getting in touch. The North East is a very beautiful part of the country with plenty of great places to visit. You should be able to get a few ideas from the following website http://www.visitnortheastengland.com/. As regards HMS Kelly it would be a good idea to visit South Shields Museum and Art Gallery, where you’ll find the Kelly’s bell on display http://www.twmuseums.org.uk/south-shields.html. Of course, you’re also very welcome to visit the Archives to have a look at the photographs we hold relating to HMS Kelly (most of which are on Flickr). You can find details of our location and opening times on our website http://www.twmuseums.org.uk/tyne-and-wear-archives/visiting-us.html. Good luck planning your trip. I hope you enjoy your visit. Thanks very much for all the help Alan. Do you know if there is a 75th anniversary remembrance service planned for the 27 crew members killed on 9th May 1940? My great uncle was one of the 27 & I would like to be there. I’m very sorry about the delay in responding to your message. I usually get a system generated message when someone comments on one of my blogs but this hasn’t happened recently. It might be worth contacting the Hebburn and Sunderland Sea Cadets to see whether they can advise you of any remembrance services. They maintain a strong link to HMS Kelly. You can find contact details on their website http://www.sea-cadets.org/hebburnsunderland/address.aspx. My grandad, Sam Wilderspin, was involved with the rescue of Kelly and its return to Hebburn. I remember him being very proud of his involvement and remained very fond of Earl Mountbatten. He passed away in 1986 and I wish I’d asked him more about it. Do you have any information on his involvement by any chance? I seem to recall he was involved in manning a pump of some sort. My mum (his daughter) knew a lot more but, unfortunately, has dementia now. She did attend some gathering in Hebburn a number of years ago in connection with the Kelly and enjoyed hearing the tales very much. Many thanks for your message about your grandfather, Sam Wilderspin. I’m afraid that our records only really cover the construction and repair of HMS Kelly and don’t give any details of her rescue. It’s a real shame! You could try searching Royal Navy records at the National Archives to see whether there’s something in there. There’s a useful research guide on their website, which might give you some pointers http://www.nationalarchives.gov.uk/records/research-guides/royal-navy-operations-1939-1945.htm. I’ll do that. Thanks Alan! Unfortunately we have very few pics of him and I wonder if anyone would have the pic of the original crew compliment. Many thanks. Many thanks for getting in touch. The only image of any crew members that I know we have is a shot of the HMS Kelly bowls team, which played the shipbuilders team https://www.flickr.com/photos/twm_news/10037121903/in/album-72157635252478073/. The chance of your uncle being on there is quite slim. If you haven’t already tried contacting the National Maritime Museum then that would be a good idea. You can find further information about their historic photographs at http://collections.rmg.co.uk/collections.html#!csearch;collectionReference=subject-90518;authority=subject-90518. Thanks for getting in touch. Sorry for the delay in responding – your message has only just been brought to my attention. I’ve put online all the images we have of HMS Kelly – you can access them on our Flickr pages https://www.flickr.com/photos/twm_news/sets/. If you haven’t already done so then it might be worth contacting the National Maritime Museum to see whether they can help you with ships plans and photographs. Contact details can be found on their website http://collections.rmg.co.uk/collections.html#!cbrowse. Best wishes and good luck with your model. Am researching Alexander Watt’s naval records. My late father was not a crew member of HMS Kelly but was rescued by her from the sinking of HMS Courageous in September 1939. Reading the history of HMS Kelly brings home the incredible courage and fortitude of all those involved in the conflict. As a youngster in the 1950s/60s I remember listening to a radio play or documentary about HMS Kelly. Do you know if a copy of the broadcast still exists. The music which provided background for the broadcast was the song “Has anyone here seen Kelly?”. Thanks for getting in touch and sorry for the delay in responding. Your message has just been brought to my attention. I’m afraid that we don’t have a copy of the broadcast but if you haven’t already done so it might be worth checking to see whether it survives in the BBC Sound Archive. You can find further information at http://www.bl.uk/collection-guides/radio-broadcast-recordings. I hope this helps. Now then I must go and find those photos on Flickr that are referred to in a post. Thanks for getting in touch. Sorry for the delay in acknowledging your comment – it’s only just been brought to my attention. I’m really glad that you enjoyed reading the blog and all the comments and I hope you managed to make the visit to the North East. Good luck with your family research. Been reading through these very interesting posts relating to HMS Kelly. My Grandfather, whom unfortunately I never knew, worked at Hawthorn Leslie’s, and on the building of Her. My Dad, who passed away in 1994, always said that he referred to Kelly as ‘his ship’ because of his pride at being involved. Unfortunately, I don’t know much about my Grandfather except that he worked at Hawthorn Leslie and met Lord Mountbatten whom he held in very high esteem. Wondering where I can find out more about his role at the shipyard etc. His name was Patrick English. Many thanks in anticipation. Thanks for your comment. We have a lot of documents in our Hawthorn Leslie collection but sadly these don’t include many items relating to the workers. Most of the records concern the ships and engines manufactured by the firm. A quick check through our lists suggests that it’s unlikely that the collection will include any direct reference to your grandfather. If anything should turn up, though, I’ll be sure to get in touch. It’s great to know of your grandfather’s pride at his involvement in building the Kelly – it was a feeling that seems to have been shared by many of those involved. She was a much loved ship. Many thanks for your reply Alan. I remember as a kid, my dad showing me a photo of his dad shaking hands with Mountbatten at Hawthorn Leslie’s. Sadly my dad passed away in ’94 and neither my mum or I have any idea where that photo is. Just remember he was a smallish man, and was wearing, in that photo, in a light-coloured long overcoat. Is there anywhere I can look for photos from the yard on line? Think I’d recognise the pic if I saw it again despite it being almost 40 yrs since seeing it. Again, thank you for your reply. Much appreciated. I’m not sure whether you’ll be able to find the image online. If it was taken for one of the newspapers then you could try searching on a website such as http://www.britishnewspaperarchive.co.uk/. It’s a bit of a long shot, though. If anything turns up in our Hawthorn Leslie collection I’ll get back in touch. My father was on the Kelly with Mountbatten in Narvik and was in the water,we have tried to get hold of his war records but until recently we did not know he was signed up under the name of Moat my nans maiden name as he was previously in the Hussars and lied about his age at Shornecliff so his mother had to buy him out.After the war I was born and my father was suffering epiletic fits and post war syndrome and spent the rest of his life in a mental home I still remember the shrapnel in his head and his memories of Mountbatten the Kelly and HMs Eskimo. I’m sorry to hear how your father suffered as a result of his war service – that must have been very hard for the whole family. Good luck with your search for his war records. I suspect that you already know where to apply for the information but if not, there’s useful information on the following website https://www.gov.uk/get-copy-military-service-records. Many thanks for getting in touch. I’ll forward that to a colleague at South Shields Museum. They might be interested in your model of the Kelly. Dear Alan my grandfather served abord the Kelly when it was sunk and I believe there is a chapter in a book somewhere that mentions him. His name was Leslie Stewert (nickname Sam) he was operating pompom guns. Can you help? Looking at some of the archive photos I see my father with the Hawthorn Leslie bowls team when they played crew of H.M.S. Kelly whilst she was building. My father was ship manager for the Kelly and Lord Louis asked him would he like a souvenir, he sent him a framed photo and letter promising “That the ship will remain”a picture” of which you may well be proud.” My father retired in Sept.1959. He used to attend the Kelly reunions most years. We had a sword belonging to Lord Louis which we gave to the HMS Kelly sea scouts. His name was Peter Ross Smith. I am looking for the description/identification of the HMS Kelly crew members in the photograph taken at Malta in May 1941. Would you have any information? I am particularly looking for Lt. Cmdr. Lord Hugh Tristram de la Poer Beresford (about whom we corresponded some years ago) and his cabin-mate Surgeon Vincent Sheridan. The copy of the photograph I have got is so blurry that it is impossible to identify anyone. Perhaps you could suggest a good one? I would be very grateful for any clues. My grandfather ( and namesake ) Bob Hartness built the Kelly and also was on the team of men who repaired her after the torpedo attack.He finished his career as foreman plater. He sadly passed away in 1977. RFA Sir Bedivere just before he retired. My father, James T.Sanderson was an electrician at Hawthorn Leslie’s Shipyard and worked on HMS Kelly when it was being built and later he was foreman electrician when working on the various war damage events. I vividly recall as a small child being taken on a ferry ride down river to see the Kelly on its return after the torpedo attack. It was so low in the water it almost looked as if it was in two parts! The memory of that is seared into my memory. I still have a Christmas Card showing a photograph of HMSKelly dated December 1939 and a formal invitation card to him from “ The Captain and Officers H.M.S. Kelly at Home on-board 4.45 pm dated 22nd August 1939 Captain Louis Mt Batten “. Although I was only a child I was so lucky during the war to be taken by my father to look around a number of warships – something that undoubtedly would not be allowed today. My father treasured his memories of all ships he worked on at Hawthorne’ Yard but his favourite topic was always HMS Kelly. Sadly he died in 1981. In 1941 I was four years old and had just moved up from a very old House in East Jarrow on the banks of the Tyne. Our house was not very far from the Anglo-Saxon church on the banks of the River Don, where St. Bede wrote his world-famous “History of the English Peoples”. My father, also Robert Hartness, was at that time thirty four years old. He had been a shipyard worker for more than twenty years. He served his time as a Plater and was in the team who built HMS Kelly. The poignant story of that tragic ship was part of our family history. 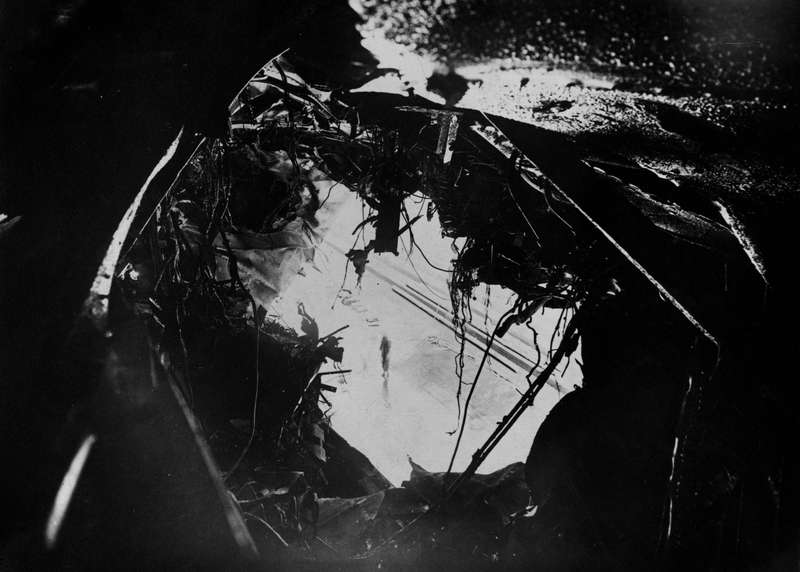 My Father was also part of the crew who had to witness and assist in the removal of the carnage caused by the massive explosion evident in the photograph of the damaged ship. What an awful experience that must have been. Imagine the feelings of those hard-bitten shipyard workers, like my Dad, survivors of the Jarrow Crusade, not to mention the shock and horror of the relatives of the brave men blown to pieces in the broken and busted HMS Kelly. 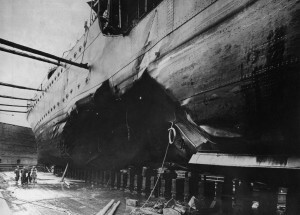 However, there was a war on and the ship had to be repaired on the double and refitted for further action at sea. These men from the war years were resolute and tough as nails and they threw themselves into the task of getting that ship repaired in double-quick time. So, 77 years after the Kelly incident, I have to say I’m proud of my father and his role in building the Kelly and in the trauma of rebuilding it for more active service at sea. I’m also proud of my nephew. in the Mediterranean and had to swim for it more than once.” That was the end of the conversation. love to find a list of servicemen on these two ships. Bill. Vancouver, BC. Hi everyone, just doing a bit of research for my Mother as her uncle served on HMS Kelly as a stoker in the engine room of the ship. His name was Jimmy Doyle from Liverpool and unfortunately he went down with ship when it was torodeoed. If anyone has any old pictures or information it would be greatly appreciated. Many thanks…. Just seen your post and if your mothers uncle was a stoker in may 1940 that torpedo attack caused The Kelly to limp back to The Tyne for repairs. The fate of this seaman you may find on the photos at the top of this blog as it shows the damage to the boiler room area. He may well be buried in Hebburn cemetery as 27 from that tragic time are buried there.